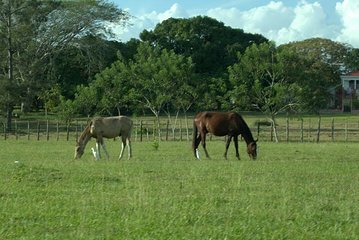 Explore las sabanas abiertas de la campiña de Belice en una excursión a caballo desde la ciudad de Belice. Conduzca fuera del centro urbano hacia el pueblo rural de St. Paul, donde prevalece un ritmo de vida más lento. Explore el pueblo en sí y los campos y bosques circundantes a caballo, con oportunidades para montar a caballo de manera independiente, si lo desea. Después del paseo, recargue energías con un almuerzo de cocina tradicional beliceña antes de regresar al puerto de cruceros. Incluye un almuerzo típico de Belice. My husband and I were the only two people on this tour. Our driver/guide was polite, attentive, and a good source of info about his country and culture. We drove way out in the boonies. We had no idea where we were. After almost an hour we turned into a private drive. The farmer at this house provided an aluminum step ladder for us to climb onto the horses. The horses were small, the saddles and bridles were mismatched and old. Our driver/ guide and his friend wearing flip flops led us on foot through the back pasture, down a dirt road, into another pasture. The horses plodded along behind the men, walking down a path through the grass and shrubs. I felt bad that the men were just walking in the heat. I didn't like that they were on their cell phones !!! Kinda ruins the atmosphere of being on a horse in the countryside. Back at the house we were given the option to ride around the yard some more. We chose not to as it was so hot and humid. I tried to pet the underfed, super skinny cats, but they ran away. The only lunch offered to us was some kind of small fruit picked off a tree in the yard. I fed mine to the horse as I was unsure of the safety of my eating it. Although the guys tried to make it interesting by telling us about the various plants and fruits grown there, the whole thing was awkward, unprofessional. We were left to wander around, not sure what to do next. When my husband asked to use the restroom, he was told to pick any bush ! None of this tour was what we expected. Did not get what was described or what we paid for. This tour was amazing! Waylon is incredibly friendly, patient, and happy to share tidbits about growing up in that part of the country. As a newbie I had no problems getting in the saddle and enjoying the hour-long ride. Great opportunity to explore Belize's more rural areas. Would highly recommend! Amazing tour. Waylon is very friendly, patient, and happy to share tidbits about growing up in the area. As a newbie I had no problem getting into the saddle and being able to enjoy the hour-long ride. Great chance to explore Belize's more rural side! Would highly recommend.